The obvious way of managing this situation is to split the image into smaller tiles, operate on them separately, and merge the images back together. While we have wrappers which do this in a reasonable fashion in common languages, I was looking for a much more generic way, which affords the opportunity for additional speed ups. As a result, I’ll run through a process I developed using various snippets of code on the net. The basic premise is that we can use Matlab to split the image in an organized way, with as much code re-use as possible. In fact, this isn’t nearly as difficult as one might expect, except that SVS files contain multiple pages, which contain the same image at different magnifications for improved image navigation. Lets look at some code. 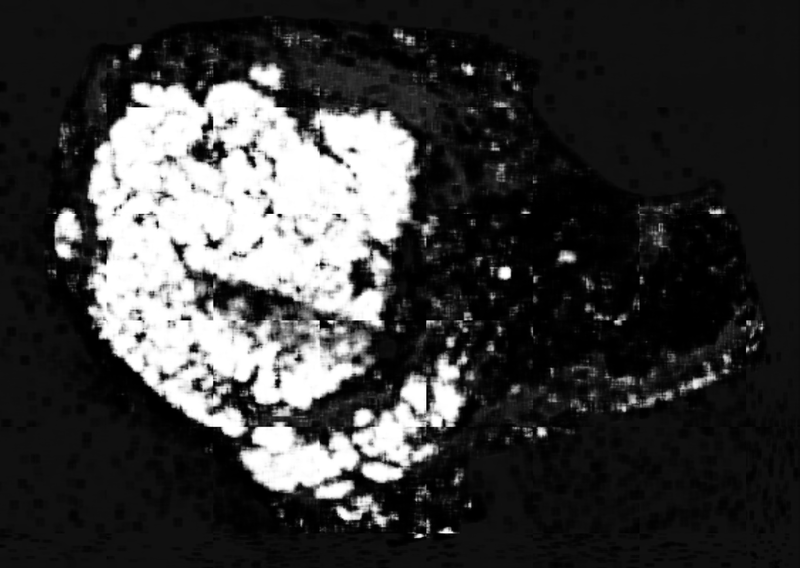 The code for this part is very similar to this blog post which leverages the idea of using image adapters to define how large images are read. tileSize = [2000, 2000]; % has to be a multiple of 16. While the tileSize needs to be a multiple of 16, that isn’t a constraint at this stage. Its actually a requirement to save large tif images as described in the following part. We can see here the basic premise is straight forward, we use blockproc to iterate through the image and save sub images. At this point, if we want to process the tiles we can (for example by resizing smaller, or actually doing the analysis). 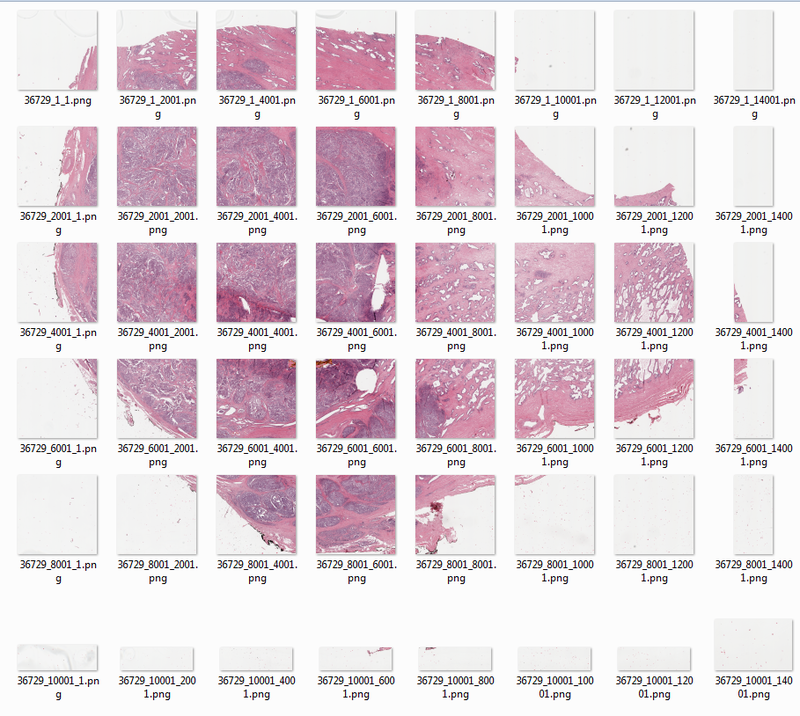 I didn’t opt for that here for two reasons, (a) the deep learning pipeline I have isn’t in matlab its in python, so these tiles will be used outside of this development environment and (b) since now we have all the tiles, we can easily parallelize whatever processing we’re interested in and compute the output for multiple tiles at the same time. Note that not all the images are 2000 x 2000. Also, we can see that some of them consist entirely of background. We can leverage this fact to avoid computation of the entire panel should we desire (for example, by requiring a minimum number of pixels to be non-background via a color threshold). Having the output means its time to stitch the images back together. This process should be straight forward. We need to specify the desired output filename (ending in .tif, of course). Then we leverage the bigTiffWriter provided here, to incrementally fill in the final image. Notice that we’ve made the strong assumption that blockproc is deterministic in that given the same image it will always crop the tiles at the same places, which is in fact true. The only small difference here is that my output images are of a different size (due to the deep learning pipeline that created the output), so I take this opportunity to scale them back up to the expected size. Also, I’ve added the option to my bigTiffWriter to support compression, which is the 6th argument in the constructor. I do not have svs files but jp2 files. Do you have any suggestions for splitting them? 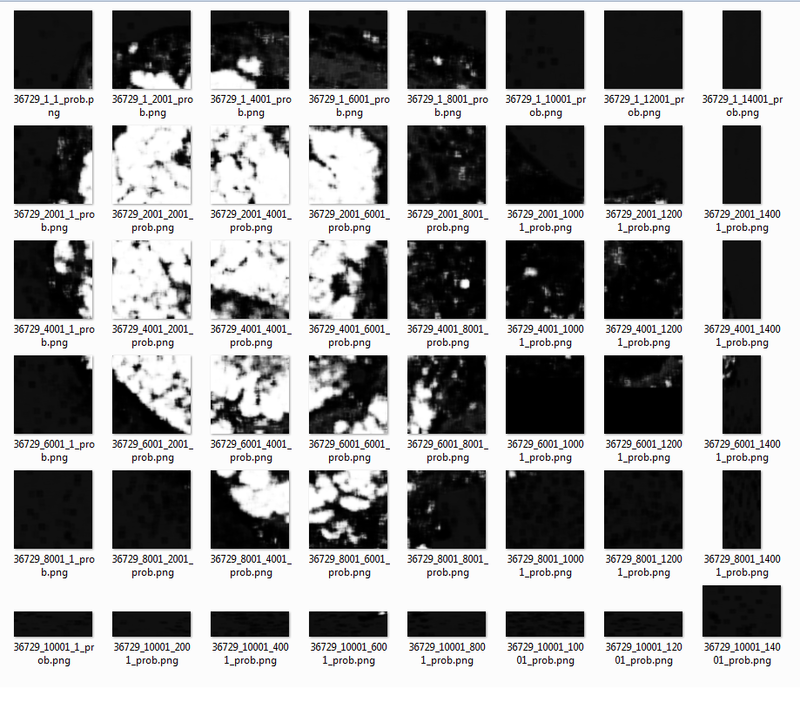 I open them in the Aperio ImageScope too but I do not have svs files of them! I got my answer! blockproc supports TIFF and JPEG2000 (jp2) natively. So there is no need to use the function “adapt” to this data format. I want to work with pathology jp2 images which are large. I am a beginner in this research . Do you know how I could split big jp2 images to blocks? input image is an svs image..when i run iminfo on it , i get only 4 rows. Also I am able to display the thumbnail version using page 2. Any other page number gives a black image. How do I create overlapping blocks? Hi, Can you tell me what and where do I have to make changes if I read my file through openslide. I am trying but, I cannot change the code appropriately. Can you go into further detail on how you used the imagemagick convert approach? Where do we execute this command? What are the inputs/parameters? I see! It seems to be working now. However, for large .svs files, the cropping function takes quiet a long time. Do you know if there is any way to accelerate this process by using the computer’s GPU? if you look at the system resources while the conversion is taking place, i think you’ll find that the bottleneck is getting the file off of the hard drive and writing the tiles. there is essentially no “computation” which takes place, just loading and saving, so if anything i imagine adding a GPU to the mix will make things slower instead of faster.